There are a lot of reasons for grilling indoors. Maybe you don't have an outdoor grill (or the space for one) or maybe you simply don't feel like mucking about with charcoal, ashes or propane canisters. Or perhaps the current weather conditions make cooking outside undesirable. Whatever your reasons for wanting to grill indoors, we've got you covered. Let's take a look at the different ways you can grill indoors and some of the pros and cons of each one. Can You Really Grill Indoors? First of all, there is really no such thing as grilling indoors. And by the way, the biggest safety precaution of all is, don't try to use an outdoor grill anywhere indoors, including a garage or any other type of enclosed structure. Beyond that, so-called indoor grilling is really just using alternate cooking techniques to mimic the effects of grilling. Even if you have a high-end range with a built-in grill (and the accompanying oven hood), you can almost replicate cooking on an outdoor gas grill, but not completely. And charcoal grilling can only happen outside, and it's from charcoal that we obtain the truly high temperatures characteristic of grilling. Every other cooking technique is at best an imitation of grilling. Broiling is fairly close to grilling in terms of temperature, with the key difference that on a grill, the fire is underneath the cooking grate and the food sits on the grate, which is hot, and both fire and hot grate cook the food from below. With a broiler, the food sits on a tray or in a shallow pan or baking dish and the heat source is situated above the food. With no grate, and with the food situated between the fire and whatever it's resting on, there's no way to get grill marks on the food. Moreover, unlike with a bed of coals underneath, when you're broiling, the drippings of your food have to go somewhere, even if it's a sheet of foil on the broiler pan, so things can get a bit messy. Still, broiling is a decent substitute for an outdoor grill. Here's more about using your broiler. With its ability to get roaring hot and hold that heat, coupled with the built-in ridges on the bottom of the pan, a cast-iron grill pan might be an even better substitute than broiling. Although grill pans made from other metals are available, cast iron grill pans are superior. Because cast iron pans have so much mass (and because iron is a poor conductor of heat, meaning it stays hot once heated), it won't cool down when you add your meat. And that's important, because when grilling, you want to sear your meats well, which is only possible with very high heat. Lighter pans will cool off when you place your meat in them, even if you've let the meat come to room temperature before cooking (as you should). Another difference between a grill pan and an actual grill is size. Even a 12-inch grill pan will only hold two steaks comfortably, and it's never a good idea to crowd your pan, especially when you're cooking steaks. Thus this method works best if you're cooking for fewer people. You could double your capacity by using two grill pans, or a ridged, cast-iron griddle that fits across two burners on your stovetop. Here's more about cooking a perfect steak on a cast iron skillet. Which brings us to the last method of grilling indoors, the countertop grill. This is an electric appliance that is available in two main types: the contact grill (which is basically a sandwich press), and an open grill (which is basically an electric griddle with ridges). The contact grill offers one significant advantage, which is that it has two cooking surfaces which directly come in contact with the food. This helps your food get hotter and cook faster. And if you're lucky, it will also produce grill marks. On the other hand, in order to transfer its heat efficiently, it really does need to squeeze your food pretty firmly. And unfortunately, applying that kind of continuous pressure to a steak or burger while cooking is going to squeeze all the juices right out of it. 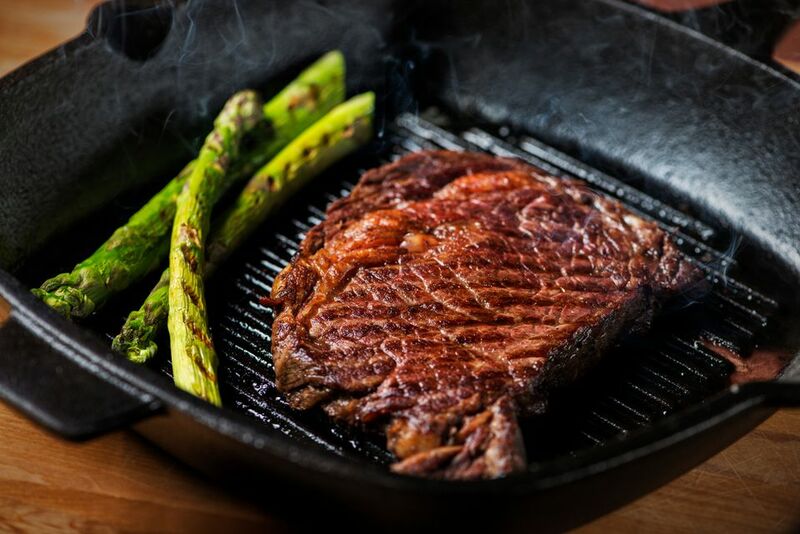 Furthermore, notwithstanding the heat of the dual cooking surfaces, enclosing your food in what is essentially a waffle iron is going to trap steam, so your steaks and burgers end up as much steamed as grilled. Needless to say, this is not ideal. But for grilling sandwiches or thinly sliced veggies, they'll do fine. Also not ideal are the open variety of electric grills, where, as with an outdoor grill, the heat comes from below and you need to flip the food to cook the other side. Again, for thinly sliced veggies or even seafood, this setup will suffice, but the heat generated won't be enough to produce results on steaks, burgers or chicken that will in any way resemble what an outdoor grill will produce. If you do go this route, look for as high a wattage device as you can find. Finally, even if you can't duplicate the flavorful seared crust that an outdoor grill can produce on meats, your seasonings can help make up for at least some of the missing flavors. Probably the best ingredient for this is liquid smoke, which sounds silly, but remember that smoke is just particles of burnt wood. Liquid smoke is literally a liquid in which the flavor compounds from actual smoke have been suspended. Thus, adding a dash or this product to your marinades is an excellent way to reproduce the smoky flavor obtained from a charcoal grill. Other ingredients, like dried chipotle or smoked paprika, when included in a spice rub will accomplish the same thing.